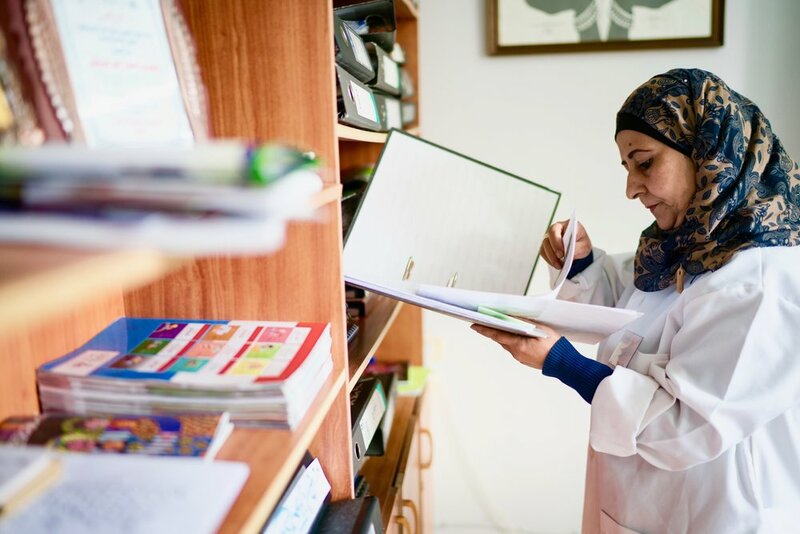 “My name is Fatima, I am a midwife and have worked with PFPPA for 18 years in the Halhul clinic in Palestine. PFPPA has had a great impact on me personally as well as the community as a whole. I experienced violence in my marriage but when I joined the organisation I learned the meaning of violence and I realised that I didn’t have to put up with it and could make decisions for myself. This was a turning point in my life. They supported me, Amina the Executive Director told me to “Make a decision and we are here for you”. My life changed for the better when I made my decision that violence had to stop…we live a pleasant life or we separate. My husband understood that I would leave him so he started to change. My life changed 180 degrees, thank God, and my husband stopped being violent. One of the proudest moments of my work has been working with a young man who was training to be a peer educator, he was violent especially with his sister. From the very start of the training, he was against the issues that we were presenting, however he started to understand our issues and we convinced him. I also met his mother and she thanked me for the change that happened in his life. She came to say that he is now helping in the house and washes dishes and other tasks that he would have thought were just for women before. The challenges that we face are misunderstanding of religion and negative traditions and customs as well as the political situation in Palestine with the occupation, the walls, the checkpoints as well as the economic situation. We work on issues that will take many years to witness any change due to the negative traditions and customs. My normal work entails working four days in the clinic with the doctor and two days community outreach. When the clients arrive, they are first seen in reception and then they are sent to the nurses’ room and I welcome them and do counselling and consultations. Only doctors are legally allowed to provide clinical services such as IUD insertion etc. but we can provide other things like pills, injections and counselling. We have recently started implementing a harm reduction approach to abortion care. I remember one woman who was 44 years old and divorced. She came to the clinic and was seven weeks pregnant. Her face was pale and tired...I felt that all the problems were on her shoulders. She was looking for a saviour. We supported her with harm reduction information and afterwards provided information on post-abortion contraception. After one or two months she sent a message thanking me, saying that we had saved her life, I was really happy for that. There are also cases of women that come here, maybe they took pills or they did something that made them bleed. They don’t tell you what they did but I can detect if I think an abortion happened. If it is an incomplete abortion, we explain how to take the treatment and side effects and we follow up with support. Women in our communities use many unsafe methods to try to end pregnancies. They drink special teas or chlorine. They jump off things or ask their children to jump on them. They sometimes put suppositories made from Arabic medicinal herbs into the cervix or inject themselves with diclophine. Although it is common, deaths are not registered as linked to unsafe abortion but are probably registered as maternal deaths. When the society says that abortion is haram (forbidden), they don’t take into consideration the issues and these women in need. Imagine if we had safe abortion services at the hospitals, we would not see these issues at all. There are women who would choose abortion for reasons like their age, their health, social issues and psychological issues. There are women themselves who say “I will die if I complete this pregnancy”. One success was that the Ministry of Education were not permitting us to give lectures about abortion in schools so we met with the person responsible for the health at the ministry as we hope to talk about the issue of abortion. She became totally convinced that it was necessary for us to introduce these issues into the sessions we conduct in schools; we are now focusing on trying to get agreement from more senior staff.